Congratulations to Officer Beamonte and Officer Fekieta on graduating from the Connecticut Police Academy tonight. 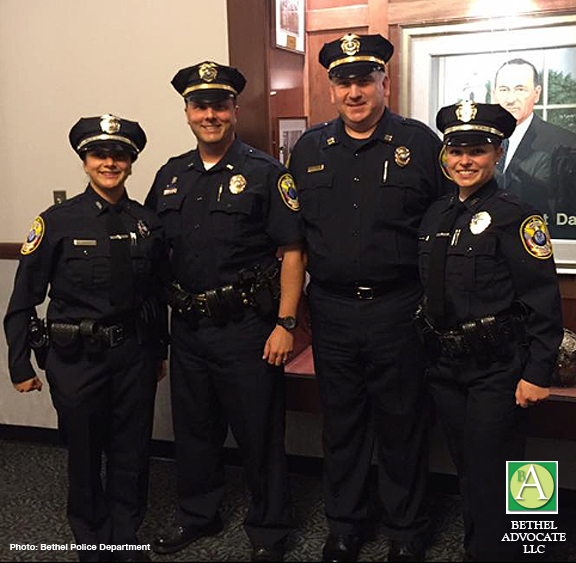 Photo: Lieutenant Michael Libertini (2nd from left)and Captain Steven Pugner (3rd from left) surrounded by newly graduated Officer Jessenia Beaumonte (left) and Officer Amelia Fekieta (right). 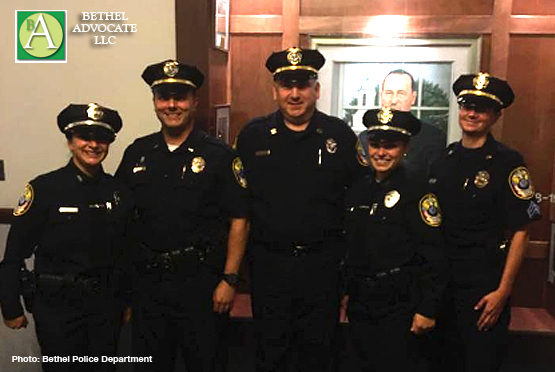 Congratulations to Officer Beamonte and Officer Fekieta on graduating from the Connecticut Police Academy tonight. Now onto 16 weeks of Field Training with senior officers before being ready for patrol on their own. Virtually all of what you mention is supprisingly legitimate and it makes me ponder the reason why I hadn’t looked at this with this light before. Your article truly did turn the light on for me personally as far as this particular subject matter goes. However there is actually 1 position I am not really too comfy with and while I try to reconcile that with the actual main idea of your point, permit me observe just what the rest of the readers have to point out.Nicely done. I just want to mention I am just very new to weblog and honestly loved this web blog. Likely I’m want to bookmark your website . You amazingly come with awesome well written articles. Kudos for sharing with us your website. It is actually a nice and useful piece of info. I’m happy that you simply shared this useful information with us. I simply use web for that reason, and get the latest news. Quality posts is the secret to attract the viewers to go to see the site, that’s what this website is providing. The overall glance of your website is magnificent, let alone the content material! Awesome blog you have here but I was curious if you knew of any message boards that cover the same topics talked about here? Thanks so much for giving everyone a very nice chance to read in detail from here. It is always so awesome and packed with a good time for me and my office mates to visit your blog on the least 3 times in 7 days to see the fresh tips you have. And definitely, I am usually motivated for the unbelievable tactics served by you. Selected 1 areas in this posting are absolutely the most efficient I have had. I’m still learning from you, while I’m making my way to the top as well. I absolutely enjoy reading everything that is written on your blog.Keep the aarticles coming. I enjoyed it! I am not certain where you’re getting your info, however great topic. I must spend a while studying much more or figuring out more. Thanks for excellent information I was looking for this info for my mission. Valuable info. Fortunate me I discovered your web site by accident, and I am stunned why this coincidence didn’t happened earlier! I bookmarked it. wonderful post, very informative. I wonder why the opposite experts of this sector don’t realize this. You should proceed your writing. I’m confident, you’ve a great readers’ base already! Thank you for any other informative site. Where else could I am getting that type of info written in such an ideal way? I have a challenge that I’m just now operating on, and I have been at the look out for such info. Helpful info. Fortunate me I found your website unintentionally, and I’m shocked why this accident didn’t happened earlier! I bookmarked it. I¡¦m not certain the place you’re getting your information, but great topic. I must spend some time learning more or figuring out more. Thanks for excellent information I used to be on the lookout for this info for my mission. Whats Happening i am new to this, I stumbled upon this I have discovered It absolutely helpful and it has helped me out loads. I hope to give a contribution & aid different users like its helped me. Good job. Thanks so much for giving everyone an extremely spectacular opportunity to discover important secrets from this website. It is always so pleasing and as well , full of amusement for me and my office peers to visit your website the equivalent of three times in one week to read through the newest issues you have. And lastly, I’m so certainly happy with the gorgeous tips and hints you give. Some 4 facts in this post are rather the most effective we have ever had. fantastic points altogether, you simply won a emblem new reader. What would you suggest in regards to your put up that you just made some days ago? Any certain? You really make it appear really easy along with your presentation however I to find this matter to be really something which I think I’d never understand. It sort of feels too complex and very wide for me. I am having a look ahead to your next publish, I¡¦ll attempt to get the cling of it! I¡¦ve read several excellent stuff here. Certainly value bookmarking for revisiting. I wonder how so much attempt you put to make one of these magnificent informative website. Thanks for sharing excellent informations. Your site is very cool. I’m impressed by the details that you have on this site. It reveals how nicely you perceive this subject. Bookmarked this website page, will come back for more articles. You, my pal, ROCK! I found simply the information I already searched all over the place and simply couldn’t come across. What an ideal web site. I was just looking for this info for some time. After six hours of continuous Googleing, at last I got it in your website. I wonder what is the lack of Google strategy that do not rank this type of informative websites in top of the list. Normally the top web sites are full of garbage. I wanted to jot down a brief comment to express gratitude to you for the splendid tricks you are posting here. My long internet look up has at the end of the day been recognized with excellent details to write about with my relatives. I ‘d suppose that many of us visitors are very much endowed to exist in a very good website with very many lovely individuals with good tips. I feel extremely fortunate to have encountered the web site and look forward to so many more enjoyable moments reading here. Thanks again for a lot of things. I would like to show my admiration for your kind-heartedness supporting individuals who have the need for help on in this area. Your special commitment to getting the solution all around came to be especially helpful and has continually empowered associates just like me to get to their objectives. Your entire warm and helpful guideline entails much a person like me and substantially more to my office workers. Thanks a lot; from each one of us. Hiya, I am really glad I have found this info. Today bloggers publish only about gossips and web and this is actually frustrating. A good site with interesting content, this is what I need. Thanks for keeping this website, I’ll be visiting it. Do you do newsletters? Can not find it. Greetings there, just turned out to be alert to your blog site through Search engine, and have found that it’s pretty helpful. I will take pleasure in if you decide to continue on this idea. What i don’t realize is in reality how you are now not actually a lot more well-favored than you may be right now. You are very intelligent. You already know thus considerably in terms of this subject, made me individually consider it from numerous numerous angles. Its like men and women don’t seem to be fascinated unless it is something to accomplish with Woman gaga! Your personal stuffs excellent. All the time maintain it up! Wow, awesome blog structure! How lengthy have you ever been blogging for? you made running a blog glance easy. The whole glance of your website is excellent, as neatly as the content material! of course like your web site however you need to check the spelling on several of your posts. Many of them are rife with spelling problems and I in finding it very bothersome to inform the truth on the other hand I will surely come back again. Thank you for another informative site. The place else may I get that kind of info written in such an ideal manner? I’ve a undertaking that I am just now running on, and I have been on the look out for such info. fantastic points altogether, you simply gained a logo new reader. What may you recommend about your publish that you simply made a few days ago? Any sure? Thanks a lot for providing individuals with an exceptionally breathtaking chance to read from this site. It’s usually so great and also packed with a lot of fun for me and my office fellow workers to search your website nearly 3 times weekly to read the fresh things you have. Not to mention, I am at all times motivated with all the wonderful concepts served by you. Some two points on this page are indeed the most beneficial I have had. very soon. I want to encourage continue your great job, have a nice day! wonderful publish, very informative. I ponder why the other experts of this sector don’t notice this. You should continue your writing. I’m confident, you have a huge readers’ base already! Hello, Neat post. There’s an issue along with your website in web explorer, might check this¡K IE nonetheless is the market chief and a good element of folks will miss your wonderful writing due to this problem. know such specified approximately my difficulty. You’re incredible! Simply want to say your article is as surprising. The clarity in your post is just great and i could assume you are an expert on this subject. Well with your permission let me to grab your feed to keep up to date with forthcoming post. Thanks a million and please continue the enjoyable work. I¡¦ll right away grab your rss as I can’t to find your e-mail subscription hyperlink or newsletter service. Do you have any? Kindly permit me realize in order that I may just subscribe. Thanks. Thank you a lot for giving everyone remarkably brilliant opportunity to read articles and blog posts from this site. It’s always very excellent and as well , packed with a great time for me and my office co-workers to search your website at a minimum three times a week to study the latest stuff you have got. And of course, I am also actually astounded with all the dazzling creative concepts served by you. Some 2 ideas on this page are surely the most effective we have all ever had. excellent post, very informative. I ponder why the opposite experts of this sector don’t understand this. Great tremendous things here. I am very glad to peer your article. Thanks a lot and i am looking forward to touch you. Will you please drop me a e-mail? A lot of thanks for each of your labor on this web page. Gloria really likes managing investigations and it’s easy to understand why. Almost all notice all of the lively ways you render precious tricks via this web blog and in addition strongly encourage contribution from the others on this article while our own child is certainly understanding a whole lot. Have fun with the remaining portion of the year. You have been doing a useful job.